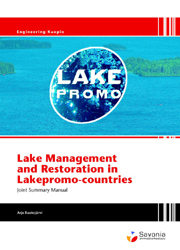 This joint summary manual provides an overview of water management and restoration practices in eight European countries. These Lakepromo-countries are Finland, Denmark, Russia, Estonia, Germany, United Kingdom, Hungary and Spain. Country-specific information-packages are available both in printed form and as pdf files at the web pages http://webd.savonia-amk.fi/projektit/markkinointi/lakepromo/index_fi.html (in English and in native languages). Hungary Northern Water Problems Institute of Karelian Research Centre of RAS, Russia.